The Inside Track. Heather Parsons, who has lived on Skopelos since 1986, tailors every holiday we arrange, and leads the walks. Her intimate knowledge of, and love for the island and its special places make the difference between a good holiday and a great one. Tailor made. 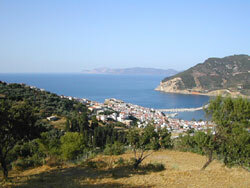 Through Skopelos Holidays you can book anything from a single walk with Heather to a family holiday. Whatever suits you.